Colorado Coalition for the Homeless (CCH) strives to provide health care services to those experiencing homelessness or at-risk of homelessness. The financial situation and health insurance coverage status does not impact a person’s eligibility to receive services at the Colorado Coalition for the Homeless. However, under new SB17-065 federal law, CCH must post all health care prices for those who are ineligible for free services; these prices are an estimate. If you have any questions about the cost of CCH health care services, please contact CCH’s Registration Team at (303) 312-2220. If you are covered by health insurance, you are strongly encouraged to consult with your insurer to understanding any financial responsibility you may have for particular services. If you are not covered by health insurance, please contact the Stout Street Health Center Registration Team at (303) 312-2220 for further information regarding your care. The Colorado Coalition for the Homeless has been delivering health care for the homeless in downtown Denver for over 30 years. Our Stout Street Health Center, provides integrated health care for more than 13,000 homeless individuals each year. Opened in 2014, the 53,192 square-foot Health Center replaced the former Stout Street Clinic, an aging structure that lacked adequate space to effectively meet the complex healthcare needs of an expanding homeless population. 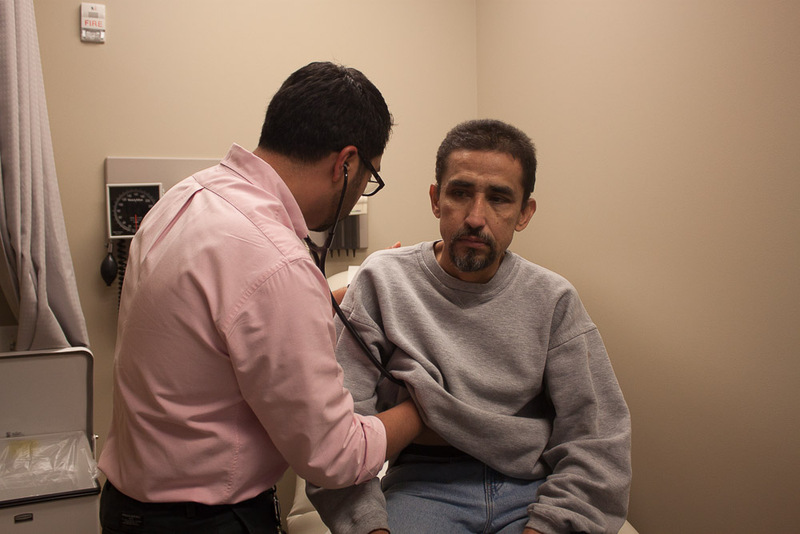 The Health Center introduces a unique model of integrated health care targeted to the needs of homeless patients. It fully incorporates patient-centered, trauma-informed medical and behavioral health care, substance treatment services, dental and vision care, social services and supportive housing to more fully address the spectrum of problems homeless adults and children bring to their medical providers. The Health Center offers a range of health services in one suite, from one team who work closely with each other to care for our patients. Services are provided to individuals experiencing homelessness or at-risk of becoming homeless regardless of a person’s ability to pay or immigration status. As a Federally Qualified Health Center (FQHC), the Colorado Coalition for the Homeless’ (CCH) health care system is eligible for Federal Tort Claims Act (FTCA) medical malpractice liability protection. CCH is a Health Center Program grantee under 42 U.S.C. 254b and deemed a Public Health Service employee under 42 U.S.C. 233(g)-(n). Come to Stout Street Health Center in person on Monday, Tuesday, Thursday, or Friday between 7:00 am and 11:00 am, and on Wednesday at 11:00 am. If eligible, you will be assigned to a healthcare team and our staff will help you coordinate the care you need. For a same day appointment, call (303) 293-2220 between 8:00 am and 4:00 pm, or come in-person at 7:00 am. On Wednesdays, call between 12:00 pm and 7:00 pm, or come in-person at 11:00 am. Or, schedule your appointment online through the patient website. To access the patient website, you will need a security token, which you can request from a front desk staff member. Through the patient website, you can access all of your health information in one place, schedule appointments or check upcoming appointments, view your medical records, lab results, and diagnoses, request prescription refills, and email your doctor. To schedule an appointment, call (303) 293-2220. Children are seen during regular Health Center hours. To schedule an appointment for adults or children, call (303) 293-2220, or come in-person to the Health Center, Monday through Friday at 7:30 am. For dental emergencies, please arrive at 7:00 am. Emergencies are seen on a first come, first serve basis. For information about Eye Clinic services and appointments, call (303) 293-2220. Hours vary and are posted in the first floor lobby of the Health Center. Patients should bring their ID and Medicaid or Medicare card (if they have one). We request that bicycles be left outside of the Health Center. Patients may only bring registered, licensed service animals into the Health Center. Stout Street Health Center does not provide court-ordered treatment. Patients may come to the Health Center with or without an appointment. Every patient that walks-in without an appointment will be triaged by a nurse. Please expect to wait to be seen during our busiest hours.